Meetings are at best seen as a necessary evil, and at worst as a time waster and productivity killer. The reason is that most meetings are very one-sided. The solution? Make meetings more collaborative! One-sided meetings are ineffective because only one person speaks while the rest just listens, without a possibility to actively participate. This leads the passive participants to wonder whether their attendance brings anything to the meeting at all, or whether it wouldn’t have been better if they had skipped the meeting and did something more productive instead. ‘Collaboration’ is not just a trend, it’s here to stay. You might ask yourself now: There are always people involved in meetings, so aren’t all meetings technically ‘collaborative’? – The short answer: No, not all meetings are collaborative. The best examples are meetings in which people simply present, but other participants don’t get the chance to give their input. Or think of sales meetings, or university lectures in which one person presents, and the other listens. Collaborative meetings are meetings where every participant is actively involved and contributes to the meeting. Which is why you can simply turn a non-collaborative meeting into a collaborative meeting by giving every participant the chance to take part in the discussion and decision making. 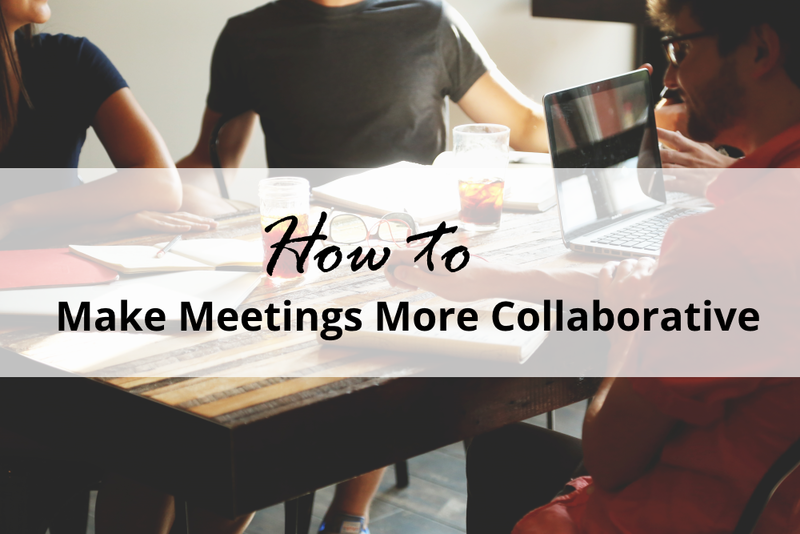 Collaborative meetings have a big advantage over meetings in which one person presents at a time. Participants are not just passive listeners, but can actively participate in the meeting and are thus, more engaged and motivated to exchange ideas, and come up with more creative solutions. Effective and collaborative meetings are only possible with sufficient preparation. Is there any information and data that the participants should prepare for the meeting? Does the meeting need visualization? Prepare all necessary documents, information and visualizations beforehand. In one of our last blog entries, we explained why brainstorming is not the best way to generate ideas. It’s better to let participants come up with ideas individually before the group works together. This might sound like a paradox to ‘collaboration’, but it’s actually a way to increase the effectiveness of collaboration. Prepare some questions that you would like to tackle at the meeting and get them to the participants early so they have sufficient time to prepare their ideas and solutions. Collaborative meetings are most effective with 3 to 9 participants. More than nine people makes the meeting too unstructured and not everyone will get the chance to really participate. Too many people in a collaborative meeting increase the risk of a few people dominating the discussion, which can lead to groupthink. Every meeting needs a clear goal. Having an objective brings structure into the meeting and helps participants focus on the important things, instead of drifting off topic. Having a common goal also creates a sense of shared success when you reach the desired outcome at the end of the meeting. It’s known that getting into the ‘flow’ can foster productivity and creative thinking. It’s a good sign, when a team gets into the flow during a collaborative meeting and bounces ideas off of each other. However, this can lead the discussion get off track, which leads the meeting to go over time. So you need to know when to halt the creative flow and bring the discussion back to the main objective. An agenda can help bring more structure into the meeting, and keep the meeting focused and productive. Include buffer times between agenda points for unforeseen events that could derail your time schedule, e.g. the aforementioned flow sessions. We’ve already mentioned the danger of groupthink, which can be detrimental to generating creative ideas and solutions. To avoid this issue during collaborative meetings, there needs to be a moderator or facilitator who encourages everyone to participate and keeps dominating participants and ideas at bay. Another method to facilitate collaboration during meetings is to try different idea generating strategies, such as assigning different roles to team members, e.g. The Dreamer or the Realist, or to make members switch roles, e.g. an optimist plays the role of optimist. Best Practice: How to Make Your Meetings More Collaborative - InLoox • Copyright 1999-2019 © InLoox, Inc. All rights reserved.